Lets face it, as much as we love our country, we have fallen behind the frontrunners in regards to technology. America does lots of things very well. Our entertainment media is the envy of the world. Our East Coast market cities are the dream of many an immigrant. Our spacious countryside is a relief to those crammed on an island with millions of other people. Our technology however, especially in the field of wireless communications, could use some work. Most of our problems stem from the lack of infastructure. 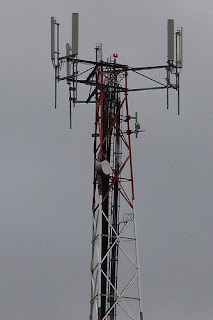 Just recently we made the final switch between analogue and digital cell phone towers. Now that carriers are finally free of the burdensome task of maintaining analogue infustructure to match their new digital infastructure, perhaps there will be money for improvement. Carriers must not only placate the masses by providing enough speed and bandwidth for them to do all the stupid things the advertisments tell them they like doing, but they must look to the future, and build a network that will allow individuals and businesses to compete on an international level. By now internet should be the new radio. Personally, I already listen to web radio whenever I have a working connection. And there you have the problem. I do not always have a working internet connection on my phone or other devices. My phone has 3G in most of the city, but it is prohibitivly expensive. If I am downtown, at school, or at a coffeeshop, I have wifi access. If I am at home I can tether to the wall. Where is the standardized network that will unify our technical lives and provide connectivity without boarder or end? While we are finally beginning to build out our 3G networks to smaller towns and cities, most of the world is putting together state of the art 4G networks! Even Russia is building a 4G network right now. Tell that to your grandfather and he might cry out of shame. Japan, perhaps one of the most advanced countries when it comes to technology, aided by their relatively small geographic footprint, and extremely dense population centers, has made video calling relatively standard and has wireless connection speeds that will make you wet yourself. Putting aside wireless for a second, Japan recently offered to consumers (not just built in a lab) fiber optic connections that would allow 1Gb/s synchronous traffic in the home. Thats 1Gig per second in, and one gig per second out, at the same time! You could send the entire contents of a typical american harddrive in about 2 and a half minutes. Back to the topic of 4G, Europe too has begun to build 4G networks. Our falling behind the curve is also part of the reason why we get older less capable devices. If you are interested in a good phone and have a few minutes search the web for my dream device: the Touch Pro HD. Available in Asia, Russia, and parts of Europe it has a screen with a pixel count comparable to that of a netbook. That's a laptop screen on a phone! We must stop our restrictive practices of locking phones to carriers and limiting mobile access to the web. Additionally, all throttling of speeds on any internet protocol must be eliminated. Phones should be bought from the manufacturer, sim cards should be bought from the carrier. America has to standardise our networks. Currently most US carriers use GSM based phones, but a few carriers use CDMA. While CDMA has its benefits, it is not as open, it is owned by one specific company and it is not used in much of the world. Japan, Europe, and Russia all use GSM. So Verizon and Cricket: It's time to switch. Why is this so important? If all carriers are using the same standard, we can establish a better functioning and more robust wireless bandwidth marketplace. If one carrier does not want to build towers in a certain area, they can buy or trade for bandwidth from another carrier that does provide service in that area. Also, if a carrier experiences an unexpected amount of network usage that would exceed their ability to provide service, they can use bandwidth from another carrier who might be experiencing a less than average load. A unified protocol makes this standard. It also means that when we take our phones to another country, we have only to remove the sim card from our carrier and insert one from the foreign carrier. In the US a lot of carriers are trying to sell content. Their content is usually substandard, but it is pushed on the consumer by placing shortcuts all over the phone, and making it cheaper to access than other options event though it is inferior. This practice is in violation of the spirit of network neutrality and must end. If we want to move alongside th e technological leaders of this age, charges levied against consumers must be based on bandwidth consumed, not on content. It's time to upgrade our 3G networks. I don't care if they are still selling iPhones. They won't work any worse than they do now. It is true that the iPhone fanatic in rural Montana might never get his 3G connection, but should we really impeded the progress of the nation while we extend 3G to areas like this where it may not even be profitable? Isn't that what all you hypercapitalists are always whining about? The profit is in the cities, it's time to upgrade the networks. We need to be on the edge. Let's analyse how the 4G transition is coming around the world. If it's just beginning, it's time to jump on board. If 5G standards are already available, it would be advisable to skip directly from 3 to 5. Yes, it will be expensive, but no one ever said being one of the best would be cheap. And thats about all you get, because everything else I could find was so ripe with technobabble even I couldn't understand it.